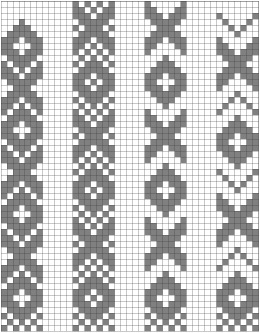 On pattern charts, one vertical column represents one pattern end and one horizontal row represents one row of weft. If a square is colored in, it means that that pattern end appears on the front of the band on that row. 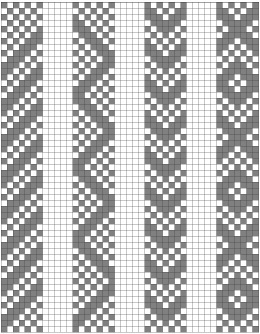 When this threading is woven in plain warp-faced weave, alternating dots or flecks in pattern color appear, represented in chart form by a checkerboard (first chart at left, below). This is the underlying structure for any pattern you weave on this threading. Here’s one way to make a chart: begin with a plain weave checkerboard in pencil, then fill in squares to create floats and erase squares to create solid areas of background color. Remember that floats longer than five rows are usually not practical unless you’re working in very fine yarn. And since a solid area of background color on the front creates a float on the back, solid areas of background color are also usually limited to five rows. In the second chart from left, caret symbols were placed on all the squares that were colored in to create floats. 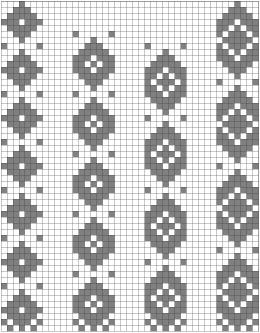 In the third chart from left, X symbols were placed on all the squares that were erased to create solid areas of background color between motifs. Of course, if you understand how floats and solid background areas relate to the underlying plain weave structure, you don’t need to begin with the checkerboard. You can just color in floats and flecks on the graph paper. Notice how two adjacent floats overlap by two rows and how motifs are built up in stair-step fashion. And in these “natural” designs, any vertical span of squares on the chart–whether light or dark–is over one, three, or five rows. Pick-up patterns in this weave structure develop naturally along diagonal lines, and the simplest motif is a diagonal line. Floats over five rows provide a way to pivot the diagonal line. If a diagonal line pivots at the sides, a zigzag is formed. If a diagonal line pivots at the center, a chevron is formed. Chevrons can combine to form diamonds and diagonal crosses or X-shapes. The size and shape of a motif changes depending on the where the pivot point is placed. Zigzags, for example, can be pivoted on the third pattern end from the side, the second pattern end from the side, or the outermost pattern end. They can also be unconnected at the sides where the diagonal line changes direction. Diamonds and X-shapes can also change in size and shape as the pivot point is varied. In the example below, the diamonds are pivoted on the third pattern ends from the sides, the second pattern ends from the sides, the outermost pattern ends at the sides, and by reversing direction but remaining unconnected at the sides. X-shapes can be similarly varied. The more pattern ends you have, the more complex your designs can be, and complex motifs have multiple pivot points. 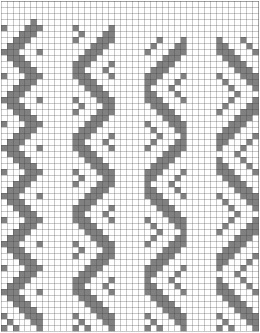 The appearance of a pattern changes depending on how motifs are spaced. 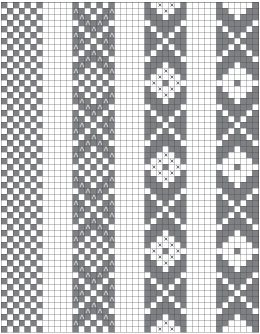 Motifs can be stacked closely together (first chart at left), woven with flecks between them (second chart from left), or woven with solid areas of background color between them (third chart from left). In larger areas of background color, flecks add visual interest and keep the floats on the back of the band from becoming too long. Thanks for writing Deb. Happy birthday and hope you enjoy the book!